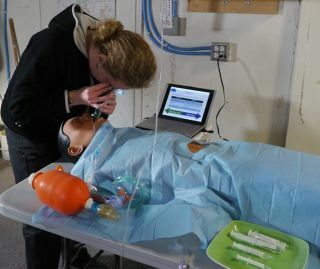 Journalist Elizabeth Howell inserts a laryngoscope in a mannequin as part of a procedure to simulate giving anesthesia for a patient. Howell was on site at Utah's Mars Desert Research Station. Editor's Note: In the Utah desert, scientists are attempting to recreate what a real-life mission to Mars might be like, and SPACE.com contributor Elizabeth Howell is along for the ride. She sends this dispatch on Mars medicine on a simulated Red Planet. HANKSVILLE, Utah — Within days of beginning our two-week stay at the Mars Desert Research Station, crew members already encountered minor medical problems — a sore back and a cold or flu among them. This 10-kilogram mannequin was used to show untrained crew members how to administer anesthesia and insert tubes inside the "patient's" throat. France's Lille 2 University mannequin was at Utah's Mars Desert Research Station. Take this six-member crew and put them on a 900-day mission to Mars, and it's possible that something could happen two or three times that would require the use of anesthesia, according to Crew 133 health and safety officer Matthieu Komorowski. On Thursday (Jan. 9), the guinea pig for his project was me — a person who has no real medical training beyond some first-aid training in high school. I was confronted with a 22-pound (10 kilogram) mannequin, a small tray of "drugs" (water in syringes) and software that calculated the patient's response as I administered the dosages. Komorowski showed me some training slides then watched as I went through the anesthesia procedure. Feeling time pressure, I messed up some of the dosages because I didn't get the math right. Komorowski, however, assured me that I hadn't done any lasting harm to the "patient." We then discussed how the procedure could be made easier for untrained personnel in the future. Anesthesiologist Matthieu Komorowski, from Lille 2 University in France, with a mannequin used to demonstrate medical procedures. I gained even more respect for anesthesiologists after he showed me how to insert the tube inside the patient's throat. Using a laryngoscope in my left hand, I was instructed to pry part of the tongue back and search for the vocal cords. Then I would aim the tube in between, using my right hand. You need a surprising amount of force in your left hand to get that laryngoscope doing the right thing. An additional complication for anesthesia is that dosages vary depending on where the crewmembers are located. In the lighter gravity of Mars, anesthesia at Earth-like levels could hurt or kill a patient rather than helping him or her. Elizabeth Howell is participating in a two-week simulation at the Mars Society's Mars Desert Research Station from Jan. 4 to 19. Have a burning question about the mission or a picture you really would like to see from the site? E-mail contact@elizabethhowell.ca for the chance to get your question answered in a future story.